Green-Go network bridges are used to make connections between two Green-Go intercom networks located on different sites, across the Internet or a private network, creating a single intercom group spread over the two sites or adding remote users. 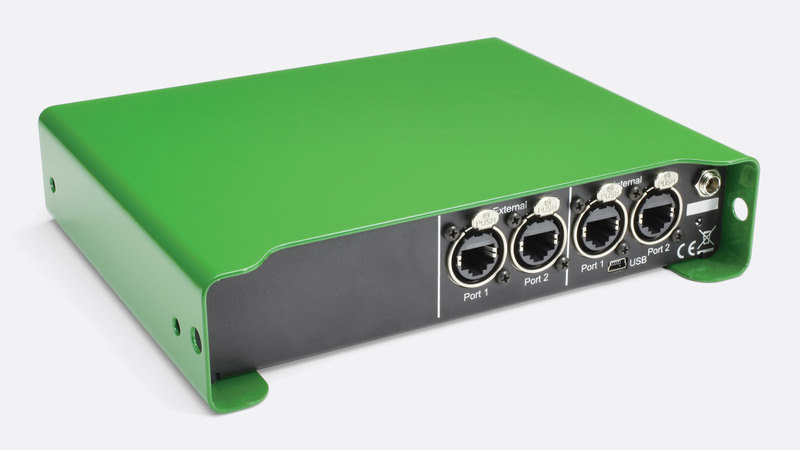 Green-Go Ethernet switches provide power over Ethernet (POE), and have additional features, such as locking Ethercon network connectors, making them more suitable for use in stage and similar environments than switches designed for use in a data centre. Bridges have four Ethernet ports, two for internal and two for external networks. The internal ones are normally used for connecting to a Green-Go network local to the bridge unit. One of the internal network ports can be used for powering the bridge via POE. Alternatively, the bridge can be powered with an external power supply. The external ports are used for connecting to the Internet or a private network. The bridges should have fixed IP addresses assigned on External networks. These should be chosen from the same range of IP addresses as is used on the local network, but outside the range of any addresses offered by the router or a DHCP server. Care should be taken to avoid using an IP address that is already in use. UDP port forwarding should be set up in a firewall between the Internet or a private network and a bridge in one of the sites. Each bridge interface stream can be used in one of two modes, group bridge mode or user access mode. In group bridge mode, a bridge connects to another bridge via the Internet or a private network, using a single stream on each site. This creates a single intercom group spread over two sites. Once communication is established, audio and call signals will be transported from one Green-Go network to the other. The new common group for the two sites should perform like any other intercom group and there should be no loss of audio quality at either site, depending on prevailing conditions. A small degree of latency may be introduced by the Internet, again depending on prevailing conditions. For every connection in group bridge mode there is an 'active' and a 'passive' member. The 'active' member always connects to the 'passive' member. UDP port forwarding should be be set up in the firewall between the Internet or private network and the 'passive' bridge to allow the 'active' bridge to connect to the 'passive' bridge. 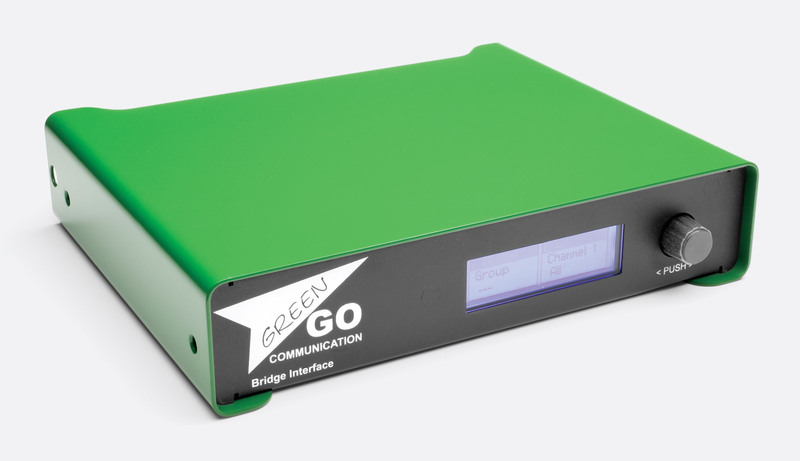 In user access mode, a Green-Go device, such as a wired beltpack, multichannel station, analogue partyline interface, wall panel or an iPhone with a Green-Go app, can connect to a bridge in a different location via the Internet or a private network. It then simply becomes another user in the Green-GO system. All the user has to do is enter the IP address of the bridge external connection - the public IP if via the Internet - a UDP port number and a password. In user access mode, the bridge is the 'Passive' member, therefore, UDP port forwarding should be set up in the firewall between the Internet or private network and the bridge. This has two virtual ports and provides two independent streams, which allows for two remote users or two bridges or one remote user and one bridge to be connected to it. This bridge has an LCD display and rotary encoder on the front panel, allowing all settings to be viewed, selected and modified. The rear has four RJ45 sockets, two for the internal Ethernet network and two for external Ethernet connections. Power can be provided by a POE switch via the second internal Ethernet connector or may be supplied by an external adapter via a co-axial inlet. Supplied in free-standing format. It may be mounted in a 19 inch rack using the optional 26-767 GGO-RMDT Rack Mounting brackets. This has four virtual ports and provides four independent streams which allows for four remote users or four bridges or a combination of remote users and bridges, for example one remote user and three bridges to be connected. Built in a rack-mounting case, this bridge has an LCD display and rotary encoder on the front panel, allowing all settings to be viewed, selected and modified. The rear has four RJ45 sockets, two for the internal Ethernet network and two for external Ethernet connections. Power can be provided by a POE switch via the first internal Ethernet connector or may be supplied an external adapter via a co-axial inlet. The device may be mounted in a 19 inch rack, taking up 1U of space. 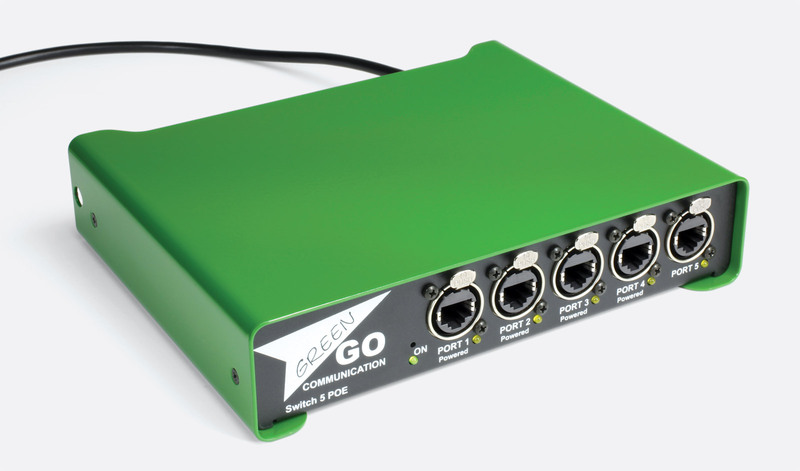 The GGO-SW5 switch will supply power over Ethernet (PoE) to four Green-Go intercom devices. The single unpowered switch port provides data but no POE, making it useful for linking to an external 10/100Mbit/s data network or to a computer. Neutrik EtherCON connectors offer a solid, reliable connection. The GGO-SW81 switch will supply power over Ethernet (PoE) to eight Green-GO intercom devices. The single unpowered switch port provides data but no PoE, making it useful for linking to an external 100Mbit/s data network or to a computer. Neutrik EtherCON connectors offer a solid, reliable connection. This has a total of 16 Ethernet ports each with speeds up to 1GB/s and two cages for use with SFP fibre optic modules with speeds up to 2.5Gb/s. The GGO-SW18GBX 'allows you to effortlessly set up VLAN trunking through fast redundant loops'. It is very easy to create virtual networks that can communicate with each other through a trunking connection', thus allowing traffic to and from devices on different networks'. By creating 'a loop between two or multiple devices, the GreenGO switchGBX 18 completely eliminates delays and device redundancy. If a connection between two devices is broken, it will be bypassed through a different route in the configuration because every device is part of a loop'. The front panel has eight Ethernet ports using EtherCON RJ45 connectors. These offer PoE and have RGB LED status indicators. There is also a TFT colour touch screen and rotary encoder 'for easy menu navigation and setup'. The rear panel also has eight Ethernet ports using EtherCON RJ45 connectors, but they do not offer PoE or have RGB LED status indicators. It also has the two SFP cages, AC power inlet and outlet. The case has ears for mounting in a 19 inch rack, taking up 1U of space.